If you’ve just started noticing hair loss, it’s too late to start taking proactive measures, but it’s also probably way too soon to start considering options like hair transplants and prescription medication. If you want to stop hair fall from progressing any further, now is the time to take action and learn what you can do to combat it. ♦Wait until your hair is at least semi-dry before you comb your hair; combing wet hair leads to a greater likelihood of breakage. ♦Using elastics and wearing tight hairstyles, such as ponytails, pigtails, or braids, will cause your hair to fall. If you must use elastics, only loosely wrap them around your hair and do not use elastics that have metal. If you want to keep your hair out of your face, invest in some wide cloth headbands that won’t rip your hair out of your scalp. If you saw little to no change after altering how you care for your hair on a daily basis, then it is time to move on to hair treatments. You can also do these while changing up your lifestyle as described above; it may not be necessary, but putting a little extra love into your hair does not do any harm either way. ♦ Olive oil: Nourishes, conditions, improves elasticity, strengthens, and possesses anti-fungal and anti-bacterial properties that make it perfect for promoting hair growth and cleaning the scalp. ♦ Tea tree oil: Unclogs hair follicles and nourishes the roots; must be used with a carrier oil, otherwise it is extremely strong. A tea tree oil massage will leave your scalp feeling fresh and tingly. This is also a great oil for those with dry scalp and dandruff. ♦ Almond oil: As a source of vitamin E, almond oil will nourish your hair and make it strong and healthy. To fully reap the benefits of a scalp massage, it must be done correctly. The key concept to remember here is that you are massaging the scalp not the hair and because of that, you need to make sure you get the oil on your actual scalp, not coat it on your hair. After you’ve heated your oil, take a cotton ball and dip it in the oil. Squeeze out the excess, then dab it down your central part. Keep parting your hair and dabbing until your entire scalp is covered. You can also apply the oil with your fingers, if that is easier. Then, rub your fingers on your scalp in small circles, exerting gentle pressure and kneading when appropriate. Massage your scalp for about 5 minutes, then pour the remaining oil down your center part, work it into your scalp, then put your hair up in a shower cap overnight to let the oil fully penetrate the hair follicle. There is something really satisfying about making and using your own shampoo and hair masks and seeing results. If you are interested in learning how to stop hair fall naturally, the internet is an absolute treasure trove of DIY hair remedies. The following examples are just a small sampling of the information found during research; they are incredibly easy to make, with most only requiring one or two ingredients and very little prep work. However, before you try any herbal remedies like the ones below, make sure you are not allergic to any of the ingredients and double check to ascertain whether or not any of the other side-effects these ingredients have will interact with a medical condition you have or a medication you are taking. • Mix 2 tbs. of olive oil and 2 egg yolk together, then add ½ cup of water. • Massage into the scalp, let sit for twenty minutes, then rinse. Shampooing is optional. • Mix 1 egg yolk and 2 tbs. of green tea together until the combination is frothy. • Apply to your scalp, making sure to get the mixture down to your roots. • Put your hair in a shower cap and let it sit for at least 30 minutes, then rinse. (Always make sure to rinse egg with cold water, NOT hot. Hot water will cause the egg to curdle in your hair). • Garlic is full of sulfur, which is great for the hair. It won’t be the most fragrant hair treatment you’ve had, but the smell goes away after a good shampoo. • Crush garlic cloves and heat them with an oil of your choosing (olive or castor are good options, as is coconut). • Apply the mixture over your scalp and let it sit for anywhere from 30 minutes to overnight, then rinse and shampoo. • Extract the juice of the amla fruit or buy amla powder and mix it with fresh-squeezed lime juice. • Apply to the scalp, let dry, then rinse with warm water. These are just some of the options available to those who want to know how to stop hair fall; there are likely hundreds more available for you to find online. Hair fall relief also comes prepackaged, as most things these days do. If you don’t have the time or the desire to make your own, hair care products specifically made to treat problems with hair fall are widely available, ranging from the incredibly affordable to the laughably expensive. If you’re interested in that route, some good brands to try are Nioxin, L’Oreal, ThymuSkin, Nisim, and Hair Genesis. 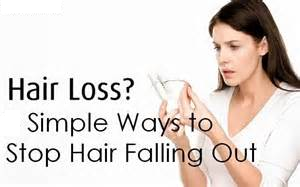 So, you want to know how to stop losing hair? Research, action, patience, and perseverance are the keys. Some of the treatments described above may not work for you; others may take a while for you to see the full effects. But do not get discouraged, because there is help and you do have options, especially in the age of the internet, where all kinds of information from all over the world is available to you.